Macedonia’s economy returned to higher growth in Q2 2018, with real GDP increasing by 3.12 per cent in YE terms and 1.14 per cent over the year (YOY). 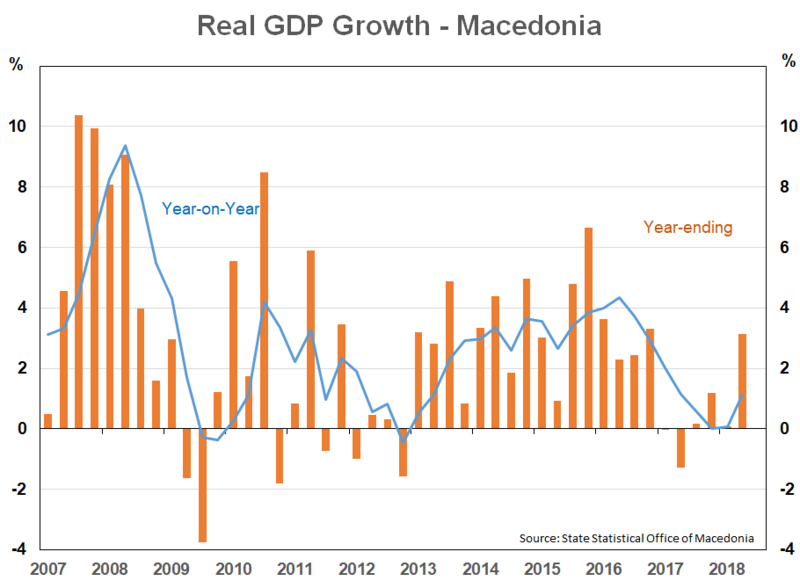 Q2 2018 marked a return to higher growth for Macedonia as can be seen in graph 1 below. Wholesale and retail trade (12.7 per cent YE) and Manufacturing (5.8 per cent) continued their recent trends of strong growth. Construction continues to offset growth (‑12.9 per cent) while Information and Communications had its fourth quarter of decrease (-9.5 per cent). Agriculture was unusually flat for the quarter (0.3 per cent YE). 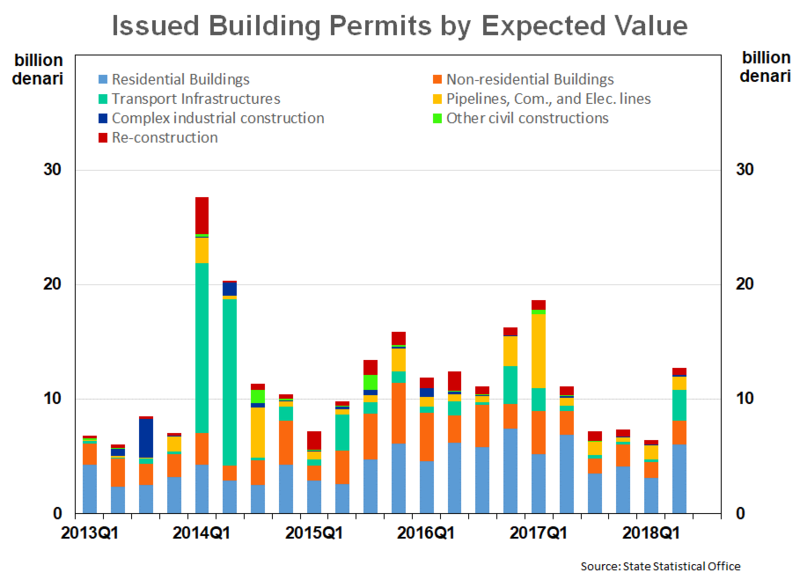 Despite the continued downward trend in construction there are some positive signs with some leading indicators: value of issued construction permits, increasing by 98 per cent on last quarter (graph 2). In expenditure terms, exports again led the way with a 13.7 per cent increase (YE) while household final consumption was up by 1.5 per cent. Gross capital formation continued its downward trend with a -11.3 YE decrease. 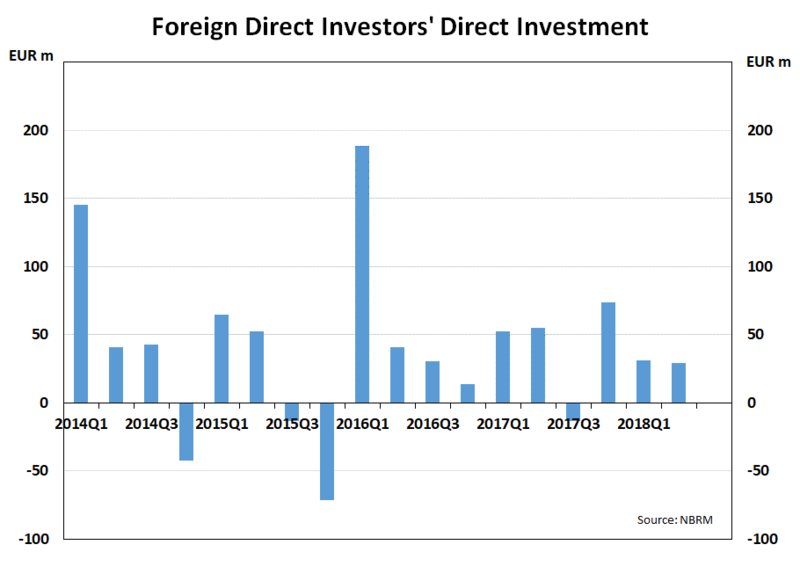 Foreign direct investment by direct investors decreased slightly by -6.8 per cent in the quarter (graph 3). 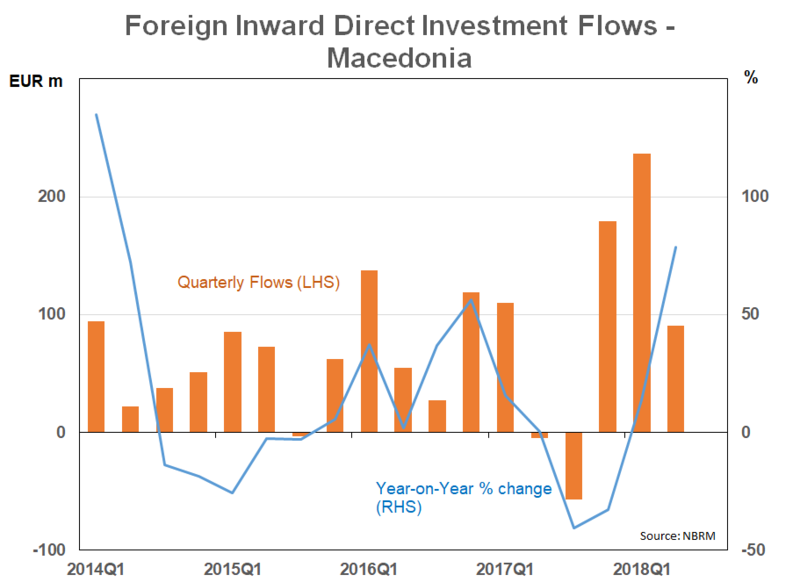 Foreign direct investment by direct investors represents additional money from overseas being invested in Macedonia (either in new or existing projects). Unemployment again improved slightly in the quarter and now stands at 21.1 per cent. 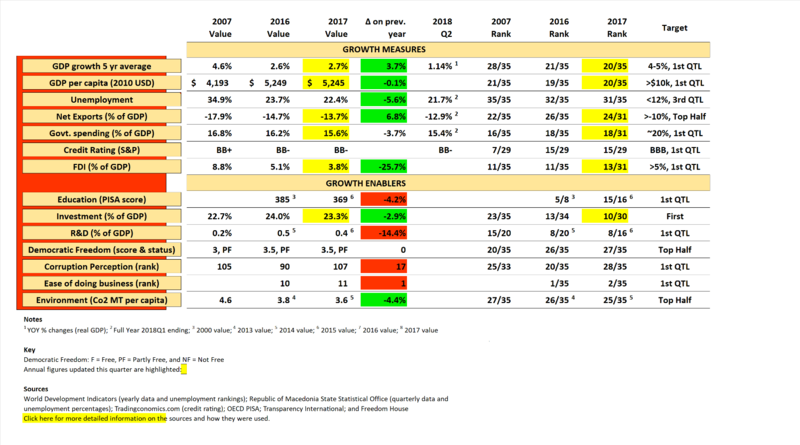 The 2017 figures for a number of the dashboard indicators were released during the quarter: the updated indicators are highlighted in table 1 below. The biggest change to note was the 26 per cent decrease in FDI as a percentage of GDP. FDI as a percentage of GDP has now fallen below our 5 per cent target. The fall reflects the divestment in the last two quarters of 2017 likely caused by foreign investor certainty over the political instability earlier in the year. FDI has since recovered in early 2018 (graph 4). Average GDP growth over the five years to 2017 is 2.7 per cent level. This is solid growth but is below our target of 4-5 per cent.